I thought I saw a cardinal at the bird feeder this morning, but it was only the taillight of my car, which is parked beyond the bird feeders under the open section between the stables. Viewed from the kitchen table, the taillight appears as a smudge of red between the gaps of the metal grid that protects the birdseed (theoretically) from squirrels. I like to watch birds, which is why we have multiple bird feeders. Lately we’ve had cardinals, juncos, white-throated sparrows, and tufted titmice. I’ve seen a couple of blue jays and a goldfinch, but they are less regular. We’re branching out to provide housing for the birds of Redbud Lane, too. Ernesto has hung the small terracotta birdhouse that a previous owner had left behind at his house in Florida, and my dad recently made two cedar bluebird houses for us. We attached one to a very tall stump in what used to be the corral, and the other is on top of a fence post at the back of our property. I can see that one from the kitchen table, too, through the back French doors. The birdhouse at the top of this post belongs to my sister. She saw it in the woods, wrecked, across the road from her little red lake cottage. She walked by a couple of times, wondering about it. Was it a birdhouse? No, it seemed too large. Maybe it was what was left of a salt lick to attract deer. Finally she could stand it no longer; she made a determined plunge into the underbrush and discovered that it was in fact a birdhouse. 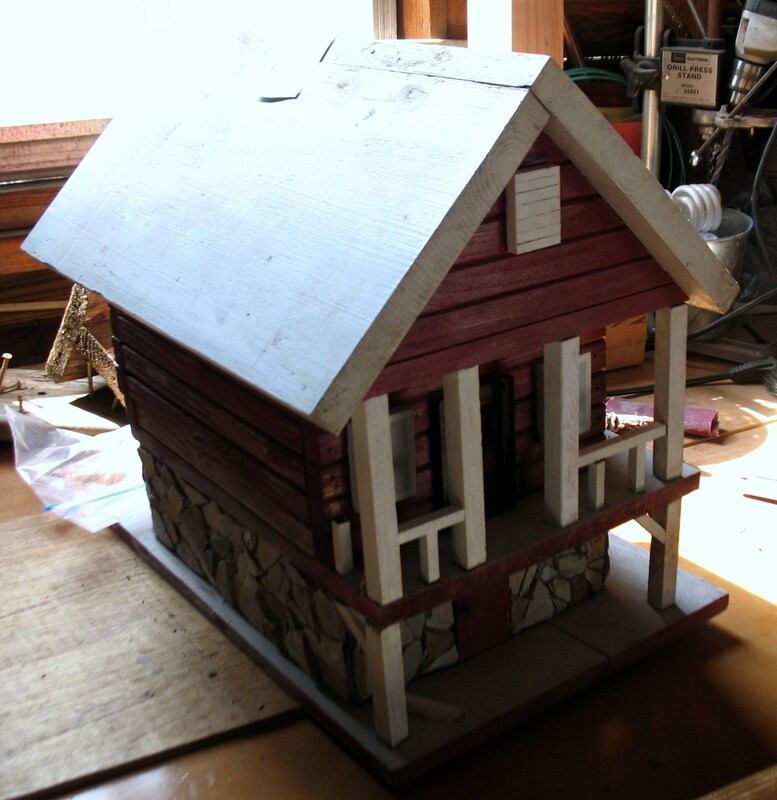 More importantly, it was her birdhouse, made specially to look like the red cottage. It’s under repair now, and I think she plans to display it on the front porch, although our dad warned her that unless she stops up the front-door hole, a bird will certainly nest in it. Birds are like that, and I don’t blame them. 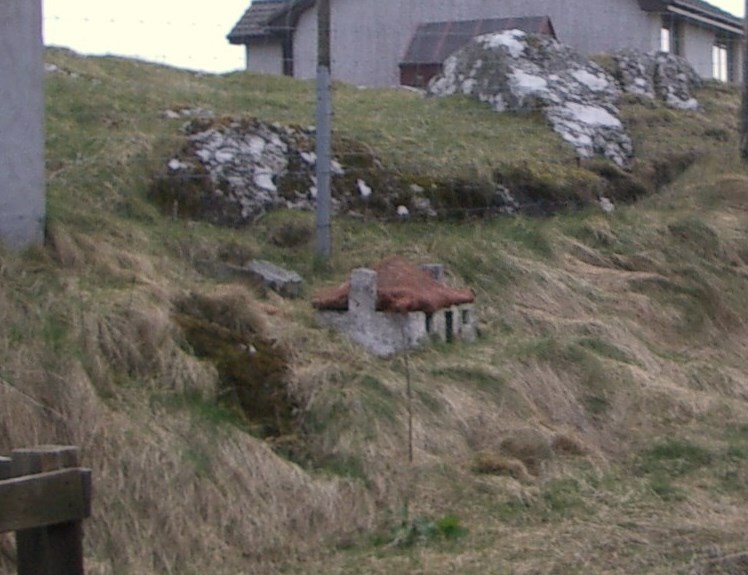 Who wouldn’t want to live in a sweet little dry house with a stone foundation (it’s real stone!) and a chimney, also real stone but in need of restoration? It provides at least the illusion of coziness and security. I wonder if it’s that illusion that gives tiny houses, whether they are for birds or toads or fairies, their considerable charm. When I told my friend Kathy about the red cottage birdhouse, she told me about the replica of her friend’s home in Grimsay, Scotland. She saw it in the back yard, and took the photo below. The teeny house is so dear that you just want to squat down and peek inside to see what’s going on. It could only be something nice: a little fire roaring on the tiny hearth, a thimble-sized loaf of bread cooling on the table. Grimsay, Scotland: A tiny house. Photo by Kathy Wilson. Full-sized houses, of course, aren’t always cozy and safe. In Florida, the danger of hurricane, tornado, flood, fire, and sinkhole made life uncertain. In Missouri we were threatened by tornado, flood, and earthquake. I remember being told by my insurance agent, the day after a tremor sent one of our office chairs rolling across the wood floor in the middle of the night, that no, we were not covered for earthquake damage. Here on Redbud Lane we have ice storms and the possibility of falling sweet gum trees. Sweet gum trees are tall. Speaking of trees, it’s even possible for Christmas lights to ignite a very dry tree, which surely must be the saddest form of home destruction possible. The simple passage of time brings houses down, too. When I was in middle school we found fragments from a vanished household in the front yard of our newly constructed house on the farm. Vintage marbles, bits of broken pottery, bottles, a clay pipe with a hole in the bottom, bricks. It was hard to tell if this was a homesite or a long-buried trash pile, but either way it offered a glimpse into the domestic habits of a family that had lived on the very ground that we considered ours. There’s another homesite on the farm property, a spot in the woods where daffodils still bloom in the spring and periwinkle blooms all summer. A nearby tumble of rocks suggests an old chimney, long-ago crumbled as the birdhouse chimney was beginning to crumble when my sister rescued it. My mom tells me that the lady who grew up there came, many years back, and took some of the daffodil bulbs for planting in her yard. I want to dig some up this year and bring them to Redbud Lane, where we have recently planted an ancestor of my grandparents’ fig tree. I hope the fig tree lives and produces fruit, and that it’s enough fruit for us and the birds to share. I don’t know where I’m going with this. What I do know is that I’ve been picking at a snarl of ideas about houses (tiny and not, for birds and people), hospitality, home, and connections. In the middle of picking at that knot, a piece about hospitality by Henri Nouwen landed in my inbox. Nouwen believed that by making our own small places comfortable and welcoming to everyone, we can change the world. And then all that has divided us will merge. And then softness will come to a world that is harsh and unkind. And then both men and women will be gentle. And then both women and men will be strong. And then no person will be subject to another’s will. And then all will be rich and free and varied. And then the greed of some will give way to the needs of many. And then all will share equally in the earth’s abundance. And then all will care for the sick and the weak and the old. And then all will nourish the young. And then all will cherish life’s creatures. And then all will live in harmony with each other and the earth. Perhaps bird houses and tiny houses are the first step.